Most of us are learning to go vertical to save space, especially when we have kids who share a room. 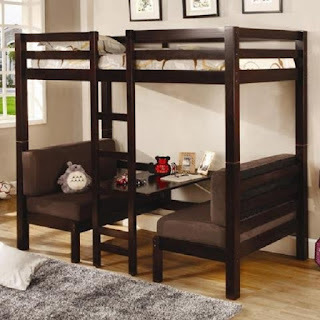 Well there's no need to settle for just a standard bunk bed or twin bed system any longer; you can combine beds with dressers and desks and save space all at the same time. If you're living in an apartment you'll love the idea of bunk beds with stairs and storage! Even a very small room can benefit from vertical decor. If the unit you're selecting has built-in dressers, be sure to allow for clearance for when the drawers are pulled out. How to Get Use from Your Old Dressers! If you find that the built-in dressers of a bunk bed system aren't enough, and you don't want to buy additional dressers, but have old ones - put the old dressers in the closet. By using your own old dressers in your closets, you'll get a closet organizer without having to spend big bucks having one custom designed! This is easy to do! Measure the dresser and the closet first to be sure the depth of the dresser will fit inside the closet. Position the dresser inside the closet so that when the closet doors are opened, there's clearance to open the dresser drawers. You may have to be creative to get everything to fit neatly, but that's the fun part! If you're fortunate enough to have a walk-in closet, they're a perfect place to use old dressers. We had a bunk bed set for our oldest two children for years. Later it was used as a set of twin beds. Definitely space saving. I've also used (and still use one) old dressers for storage in closets. Very useful advice, Barbara. I really love bunk beds, but I especially love the one you have featured with the built-in storage. I would have loved having the bunk beds with the table and benches when I was a child. It would have been like having your own dining room right in your bedroom. What fun! Even for adults, I think it would be awesome for anyone who is physically able to climb up the ladder. Too bad I don't think all of our overnight guests could manage it or I would definitely change out the guest bedroom twin bed with that unit. I really like the loft bed for adults idea - cool! We had bunk beds for our boys and it would have been very nice to have the built-in drawers below. So many creative choices! I think this is a great space-saving solution. There are so many more options now than when I had children living at home. The storage space is really handy. VERY practical -- love the idea for a family living in a small apartment in the city...and of course so many other places.